Located at the heart of one of Bristol’s most vibrant and cosmopolitan areas; Gloucester Road. 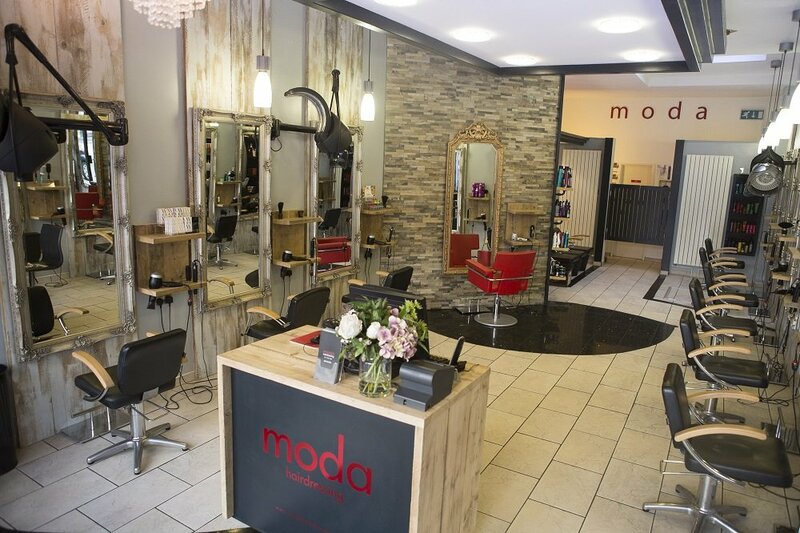 moda is a contemporary hair salon, offering a unique mix of hairdressing for men and women. Awarded five stars in the ‘Good Salon Guide’ and as a Tigi concept hair salon, our hair stylists are professionally trained and qualified in all aspects of hair colouring and cutting. We also offer a great range of products, including Tigi, Moroccan Oil and Matrix. The hairdressing salon has been interior designed to accommodate different clients’ needs giving it a different feel to many other hairdressers in Bristol. From central cutting stations to a VIP area, we offer a space and a service to match. Lovely time spent with Tina today. Very pleased with my trim. So pleased with the hair cut I've had today. It's amazing the difference a really good cut makes. I love the shaping around my face. Not to mention how friendly everyone is at MODA, usually I feel a bit nervous at salons but it's a really nice atmosphere there. Thanks all. As ever, I walk in with no clue what to do with my hair and Tina works her magic??? ?Fantastic colour and a gorgeous haircut, as well as a good giggle. Such a friendly atmosphere and I came away with a great cut and fab products. Would definitely recommend. What a fabulous salon. Really friendly team and helpful advice on style and post cut management! Definitely going back ! Thanks very much, to both stylists, the girls are both very pleased with their hair. Amazing Full head of highlights! Extremely pleased with the my visit from start to finish, the customer service was fantastic from all staff, got offered a drink several times and to my surprise they had mocha, which is literally the only hot drink I can drink, also enjoyed the chair massage. I was made to feel welcome and comfortable throughout my appointment and you really do feel like a VIP the whole time! Melissa did an amazing job with my highlights and worked very hard to achieve the look I wanted. I came in with really dark hair, so was not expecting the blonde highlights to show that bright after the first visit, but after melissa had finished it came out looking exactly like the picture! I was over the moon with result and I cant thank her enough for all her hard work, I have had my hair coloured many times, but never has it came out looking this good :D my hair has never looked better and I recieved many compliments as soon as i walked out the door! I feel so much more confident now :) Thank you so much Moda ! Excellent perm cut and blow dry as usual . Great atmosphere lovely staff comfortable chairs. Best salon in Bristol. Laura was amazing yesterday. She talked me through my curly girl hair problems and was nothing but caring and professional. The atmosphere was calm and welcoming and I'm really happy I finally found a hairdresser to come back to! I actually cried with happiness when she showed me my hair at the end, couldn't recommend Laura enough! Had my hair done by Bev this week. She was just so lovely & I’m really pleased with my hair! Ryan did an amazing job on my hair and listened to exactly what I wanted. I left feeling like I almost underpaid for the level of quality he delivered. Loved the massage chair whilst getting my hair washed and Ryan gave me a super head massage. Really pleased with the cut and style from Ryan. Really felt pampered! The haircut that I got was great, hair is back to being healthy and loved the styling! The stylist made me feel relaxed and was warm and friendly. The salon has lovely interior and is well laid out, will be back and would recommend Ryan! Freindly & professional, v happy with colour, nice salon. I’m always so happy with my hair with Moda. I’ve had Bev, Melissa and Tina andvtheyre all brilliant. I love the atmosphere there, so warm and friendly. By far the best hairdressers I’ve been to in Bristol. Every visit to Moda is a pleasure. I walked in this morning feeling a bit flat frankly and walked out feeling a million dollars. Visiting Moda is an all round brilliant experience. Tina and her team at Moda are very friendly and always make you feel welcome. From the minute you arrive you are taken care of. Stylists offer great advise about styles and colour that will suit you and I'm always thrilled with the end result. Its a very personal service which I really appreciate. I also very much enjoyed the massage chair whilst having my hair washed and the beautiful smelling products. The place to go to make you feel special and confident about your hair. Great chat, listened to exactly what I wanted, was quick and efficient but did a great job and I’m really pleased with the results! Will definitely come back and glad I’ve found a good hairdressers in Bristol! Massage chair whilst my hair was washed. Followed by hot chocolate, then Tina did my hair with those magic fingers of hers. A brilliant visit and I walked out looking and feeling good. Looking forward to having a perm next month!